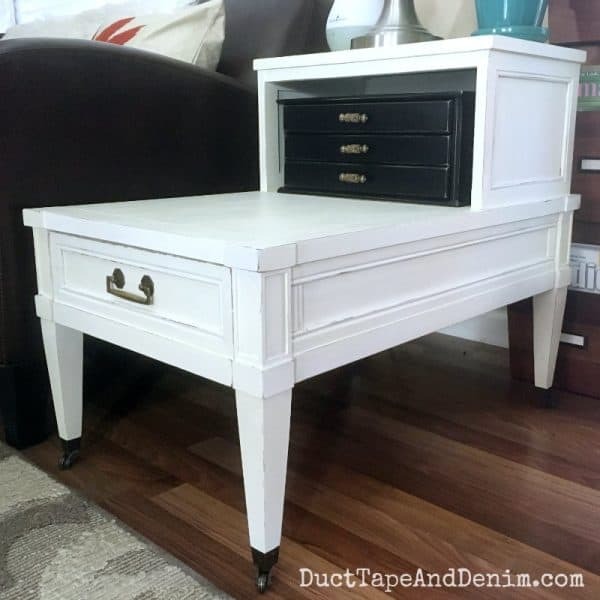 Another day… another jewelry box makeover! I bought this old wooden box last year and don’t even remember where or how much I paid for it. I really need to start taking notes when I go shopping so I can give you that info. 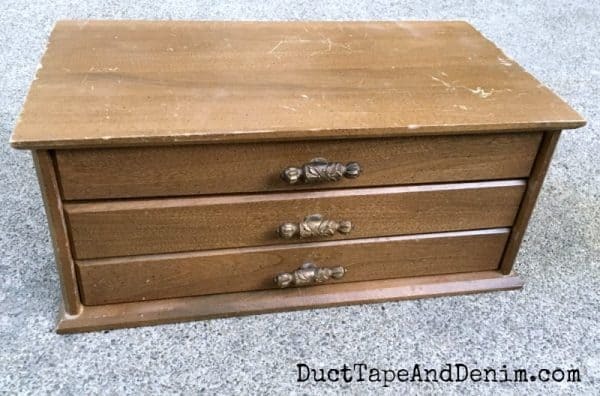 I know it wasn’t much because I have a $7.00 cap for jewelry boxes. I’m gonna guess that it was $4.99 or $5.99. It was a good size and in good condition. 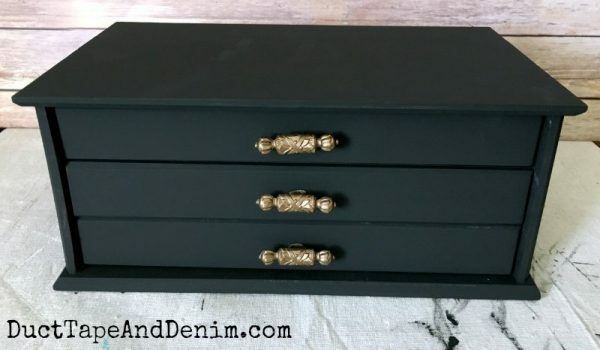 Just kinda blah… but I turned it into a beautiful black jewelry box! I thought it was a little harsh so I sanded down the edges a bit. 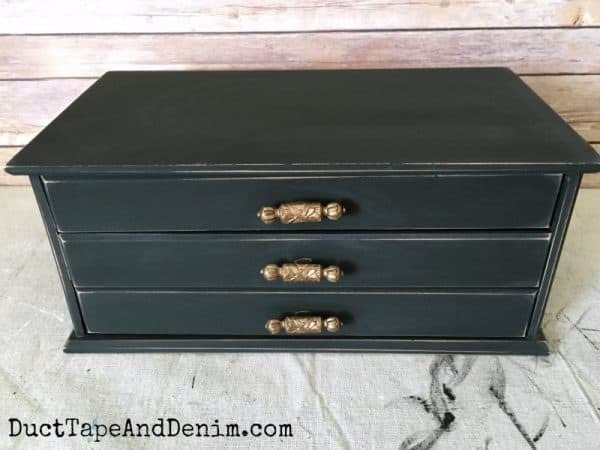 I like the “Restoration Hardware” look of the black distressed paint! After distressing the paint I wiped off all the dust and applied a coat of varnish. Then I added some gold Rub n’ Buff to the handles. 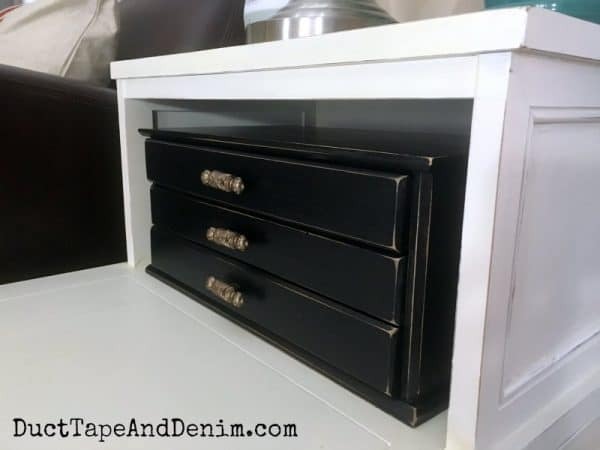 I didn’t plan this but the black jewelry box fits perfectly in my end table that I painted with chalk paint mix! It’s probably not going to hold jewelry for a while. Let me know what you think about the black paint. This is the first project I’ve shared with this color but I do have a few more. Plus I have black paint leftover and need to use it on something else! I love it – I painted mine black years ago and I think it needs a little something. maybe I will distress the edges and give it a coat of wax or varnish, then pretty up the handles. It’s very similar to yours! Wow, looks like that box will really come in handy there in your end table! You gave it a nice makeover too. Really love the distressing on it. Beautifully done! I love the black with the gold pulls. Thank you for partying with Blogging Grandmothers. I have shared your article on social media. My first time visiting your blog and oh how I’m amazed by this project and the neat new home you’ve found for it. I love it when something fits perfectly in a new place! I used to be a “when in doubt, paint it white” but Paint It Black has crept into my world lately. Having said that, right now a revamped jewellery box is sitting a few yards away from me and I painted the a sludgy soft khaki colour with Valspar and it’s so pretty. So pleased I’ve found your blog. Off to read more! Thanks, Mary! 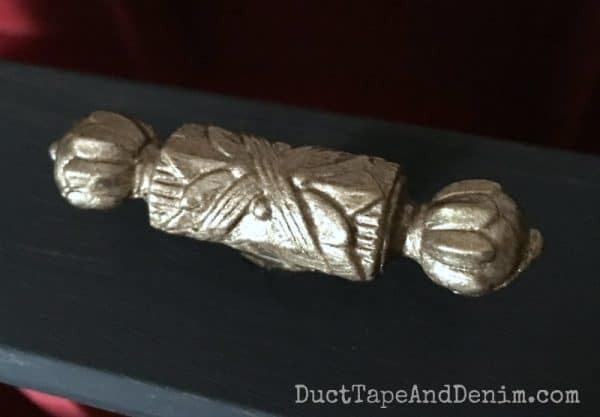 I’d love for you to come join us in my new Facebook group – https://www.facebook.com/groups/ThriftStoreMakeovers/ – It’s much easier to share photos there and I’d love to see your jewelry box! Turned out beautiful. I used to have an end table just like yours and never knew what to place in that awkward cubby. Your jewelry box fits perfectly.